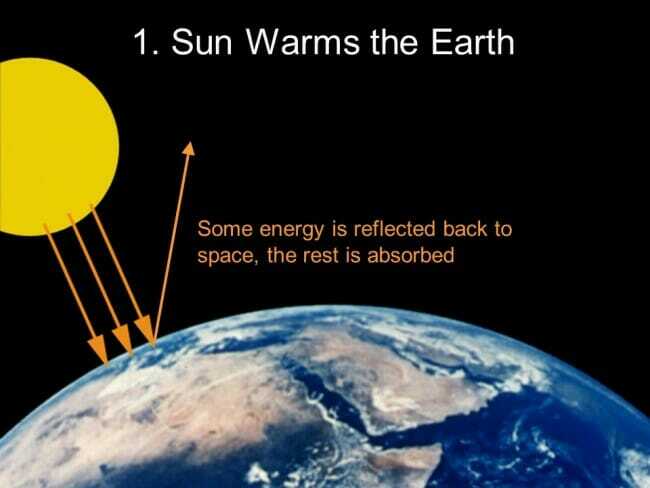 The sun sends energy via radiation to the Earth. Some of that radiation is reflected back into space, while the rest is absorbed by our atmosphere, our lands and our oceans (mostly in our oceans). If this were the end of the story, the Earth would constantly increase in temperature as more and more heat is absorbed. At the same time, the Earth is radiating energy back into space. This radiation occurs (just as does the incoming radiation) on many different wavelengths. 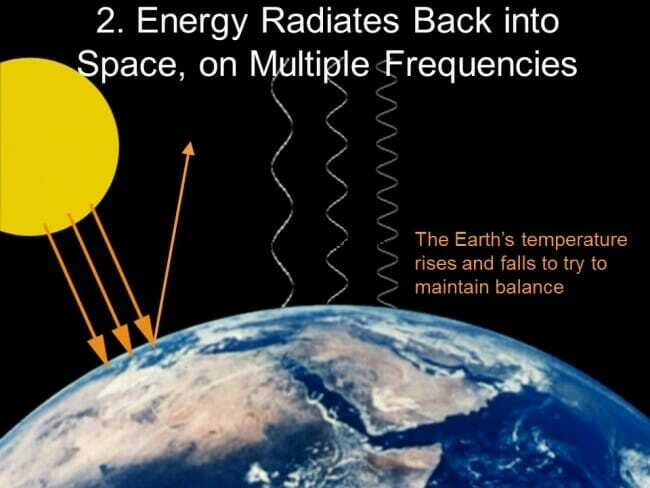 The hotter the Earth becomes, all things being equal, the more energy that is radiated back into space. As a result, Earth's temperature acts as a balancing mechanism between incoming radiation and outgoing radiation. If more heat is being absorbed than is being radiated back into space, Earth's temperature rises and until the outgoing energy radiated roughly matches the incoming. Given the complexity of the climate and Earth's systems, this is a dynamic balance, with Earth's temperature and its energy radiation to space constantly changing, but always seeking equilibrium. So now we bring greenhouse gasses into the picture. There are many greenhouse gasses, of which CO2 is actually a relatively weak example (water is a much stronger greenhouse gas and methane is stronger still). But we will talk about CO2 because that is the main gas at issue with anthropogenic greenhouse warming concerns. The purple line in the picture represents a concentration of CO2, or any other greenhouse gas in the atmosphere. Greenhouse gasses absorb some but not all the wavelengths of the radiation that is leaving Earth and going back into space. 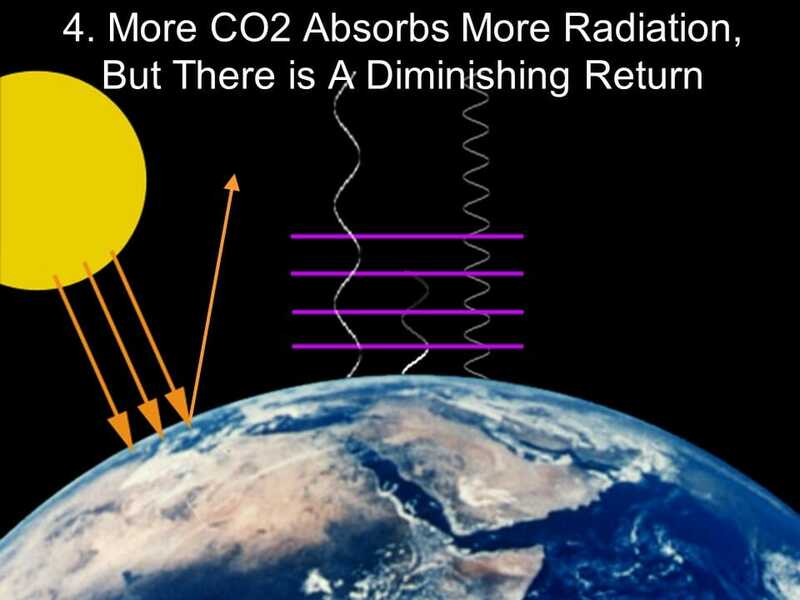 As higher concentrations of the greenhouse gas are added to the atmosphere, as represented by more purple lines in the drawing, more of the radiation returning to space is absorbed. But, in part because these gasses only absorb some but not all frequencies of radiation, there is a diminishing return effect. 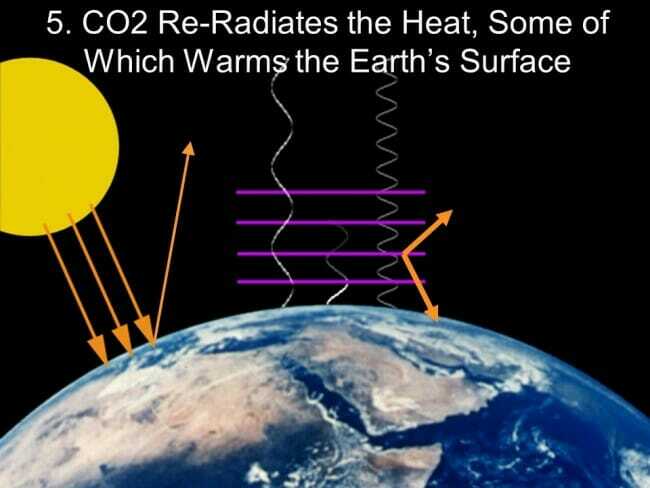 Each additional measure of a greenhouse gas added to the atmosphere absorbs less heat than the previous measure added. For this reason, temperature sensitivity of the climate to CO2 is often discussed as a temperature increase per doubling of the CO2 concentration. To take actual numbers, if CO2 concentration doubles from 400 to 800 ppm and has X effect, it would take another doubling from 800 ppm to 1600 ppm to have another X effect. As we would expect, the absorption of this radiation by greenhouse gasses heats the atmosphere. But much of this happens well above the Earth's surface. However, these warmer greenhouse gas molecules now radiate more energy. Some of that energy goes into space, where it has no more effect on the Earth. But some of it is re-radiated back to Earth, and absorbed in the air, land, and water at the surface (again, mostly in the water). This extra radiation, often called a "forcing", is the main driver of greenhouse gas warming. The Earth's temperature must rise in order to radiate enough heat to balance this new input.